If you have your own swimming pool, you are one of the lucky ones. In Phoenix, some people use their swimming pools all year long. Swimming pool maintenance doesn't have to be difficult, but knowing how to properly maintain your pool will make it last longer and be a safer place for family fun. Not checking your pool's chemistry often enough. Check the pool's chemistry twice per week in the summer and once per week in the winter. By doing this you can make minor adjustments to your water chemistry instead of big adjustments that create a wild up and down graph of activity. Allowing pH to get above 8.0. At 8.5 chlorine is only 10% active. At 7.0 it is about 73% active. By just maintaining pH around 7.5 the chlorine is 50-60% active. Keeping the pH in check will allow you to use to the full potential the chlorine that is already in the pool. Not keeping alkalinity between 80-140 PPM. Low or high alkalinity can affect water balance and ultimately a sanitizer’s ability to perform. Not checking TDS (Total Dissolved Solids) or calcium hardness on a regular basis. Check TDS every 6 months and calcium hardness every month. These also affect water balance which is different from sanitation, although related. Backwashing sand or DE filters too often. If you do this, the filter can never reach its cleaning potential. If you backwash on a regular basis for no reason, you are wasting water. Most filters require backwashing when the pressure gauge rises 8-10 PSI from clean. Not cleaning the skimmer basket and/or hair and lint pot in the pool pump often enough. If these are full of debris you will get little flow resulting in poor circulation, potentially creating a big problem. Adding chemicals, especially liquid chlorine, during the day. Try to add chemicals in the evening after the sun has set. You will get more out of them. Not brushing the walls and tile down often enough. If your circulation system is suspect, and many are, brushing down the walls will help eliminate algae problems. Keeping your tile clean will save you money. Once the tile gets calcified it becomes like plaque and will take a specialist to get it off. Make sure that you keep the space between the bottom of the cantilever on the deck and the top of the tile in check. If this cracks, then put in some silicon. You do not want water migrating from the inside of the pool out under the decking. Not running pumps long enough. You should run your pump about 1 hour for every 10 degrees of temperature. This assumes you have a decent circulation system. It is ALL about the FLOW! Circulation IS the key to a low maintenance swimming pool. Not replacing broken or missing drains or suction sources. This a real and dangerous hazard. The same could be said for defective door/gate closers and fences in disrepair. 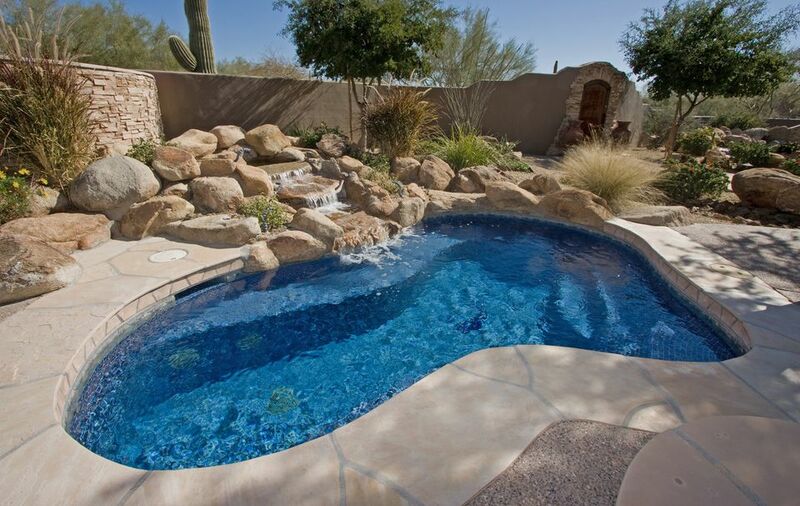 Who Should Build Your Next Phoenix/Scottsdale Swimming Pool?